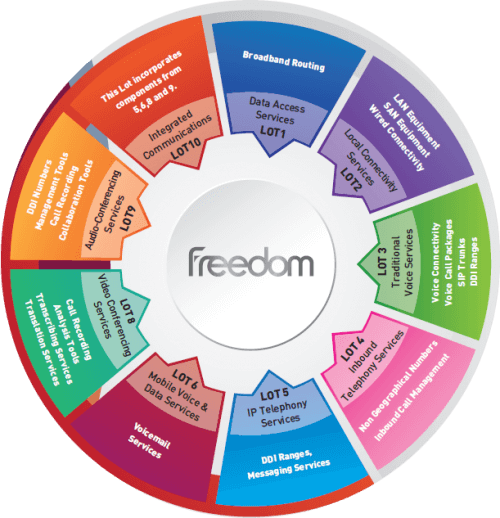 With over Over 27 years providing public sector organisations with communications solutions ranging from the installation of IT infrastructure and cabling to UC solutions, shared contact centres, virtual data centres and a host of future proofed cloud services, Freedom Communications offer our comprehensive Public Services Network Guide introducing Innopsis. This Whitepaper will help you envision the benefits of PSN allowing you to understand that the end goal is to improve contact with citizens,to allow for a simpler and more effective communication, whilst enhancing the quality of service delivered. What is PSN? Freedom and PSN…all you need to know. The Public Services Network (PSN) is the trusted, shared infrastructure that connects increasing numbers of organisations delivering public services to each other and to cloud based and hosted services they can use or share. Developed in 2011, the PSN consists of inter-connected commercial networks from a variety of suppliers whilst following common Enterprise standards, including performance and service. PSN aims to save the Public Sector money with utilisation of connectivity, greater choice of consumption and services enabling a more efficient public services. The initial aim was to provide £500m in savings per year, which according to HM Treasury was achieved in 2013. In 2013, most of the Public Sector Central Government bodies and Local Authorities were connected to PSN, reaching the initial target, with only Health, Police and Education not included. PSNGB, the industry Group for PSN Suppliers, have now updated their trading name to Innopsis. The change reflects market developments and the shift in focus to encouraging new services and working practices, maximising investment and efficiencies, making the UK an efficient, citizen focused government. Two frameworks were let by the Crown Commercial Service in 2012, covering network connectivity (PSN-Connectivity) and network services (PSN-Services). Although extended into 2016, the PSN frameworks were replaced with a new single framework in 2015 called The Network Services Framework. To summarise, in Information Technology the 2 original frameworks have now become one. Reducing costs and increasing efficiencies is ultimately what the PSN is about. It creates a more open and competitive market place where standardised networks and ICT services, simplified procurement and shared services are available to reduce costs. All public sector organisations are able to benefit from a shared information and communications structure. The PSN created a ‘network of networks’, joining organisations, departments, Local Authorities and agencies, making it easier to share information, access services and look after communities better. PSN ensures seamless, painless interconnectivity to allow for collaborative working and the sharing of information and services. This can include voice, data and video connectivity from any location through any PSN provider on any scale. The possibilities for business transformation of public service delivery are endless. The options range from building genuine collaboration processes, connecting with partner organisations, reducing duplication, sharing resources, working more efficiently and flexibly and reducing overheads such as buildings, travel and energy costs. The PSN creates easily achievable opportunities for cost-efficiency, business transformation and improvements in public service delivery – the chance to truly do more with less. The benefits of the PSN are both short and long term, but it also brings positive change to the delivery of public service with quantifiable savings and efficiencies. The end goal is to improve contact with citizens, to allow for a simpler and more effective communication, whilst enhancing the quality of service delivered. The PSN can make more of limited budgets through a number of ways, not just by saving operational expenditure but by delivering organisational change in the reduction of resource usage. Procurement through the PSN makes the whole process easier, faster and cost effective. Offerings from within the PSN are PSN-certified, meaning you can confidently choose which services you want to buy and the providers to buy them from with the full assurance of value for money and compatibility. The PSN encourages innovation and major business transformation. All public sector organisations involved can benefit from doing more with less, exploiting common ICT services to work more effectively, sharing resources, accessing information, cutting overheads, improving productivity and enhancing public service delivery. Delivering secure, high speed and reliable access within the organisation and to network services wherever and whenever they are required. The PSN streamlines day to day operations reducing the issues caused by inflexible and duplicated networks, multi-vendor service contracts and ever increasing maintenance costs. Users and organisations can securely share and access information through the PSN, enabling effective collaborative working between all public bodies at local, regional and national levels. PSN enables your workforce and offers unlimited work style options, totally independent of location all through seamless, secure, cross-boundary networks. Sharing business and application services within the public sector has never been so simple, allowing voice, video, email, messaging and data center collaboration over one network. Resulting in significant cost savings as well as greater efficiency and enhanced performance. Utilising the PSN’s versatile network infrastructure offers seamless interoperability across the entire public sector, allowing all users to share information and access standards-based services. To that end, creating the opportunity for a substantial reduction in overall operation expenditure. The PSN delivers peace of mind combining the benefits of a multi-supplier environment with the reassurance of common levels of technical assurance and service management, guaranteeing resilient performance and consistent levels of service. The standard security class for PSN is CAS (T), a recognised level of security assurance for Business Impact Level 2, protecting critical communications service across the public sector. As greater levels of security are needed, the option for CESG-approved solutions is also available as needed. In order for any organisation to fully capitalise on the benefits of PSN, the choice of which provider to use must be given great consideration. Who will YOU use to harness the benefits of PSN? Freedom already has extensive experience working with public sector customers, with longstanding relationships with over 10% of Local Governments. We are at the forefront of the PSN, unique in bringing together the experience, credibility and capability for fully integrated and fully scalable end-to-end PSN solutions. Already contracted to deliver services to over 500,000 public sector end users at thousands of different sites across the UK, our expertise in Unified Communications, Voice, Data, Connectivity, Cloud, Security and Support places us well as a PSN provider. Freedom provides clarity in today’s complex business communications environment while working closely with organisations from all sectors to shape what can be achieved through the intelligent use of technology. Key for PSN Diagram: Incorporating the new Network Services Framework, put in place in 2015. 10 Integrated communications: The provision of integrated communications solutions to provide a consistent user interface across a range of end-user devices. This lot incorporates components from lots 5, 6, 8 and 9. Over 26 years providing public sector organisations with communications solutions ranging from the installation of IT infrastructure and cabling to UC solutions, shared contact centres, virtual data centres and a host of future proofed cloud services. Our public and private sector customer base split is 50/50, demonstrating we have developed ourselves as an efficient and cost effective provider to Governmental and local bodies. Having developed our services around the PSN criteria we are committed to its success. This has required significant technical and commercial changes for us internally, with over 18 months organisational and propositional development. We have proven experience of delivering Communications services across the UK, demonstrating we can enable our public sector customers to adopt the PSN and the benefits that can be achieved. We have in-depth experience on the scale and scope needed to achieve the results the Government is looking for, whilst maintaining a close, personal client relationship throughout installation and once up and running. For decades we have been working closely with, for and across all levels of public sector authorities and agencies. Our public sector heritage has enabled us to become a long-term trusted advisor, proving we can deliver organisational benefits in the good times and do whatever is necessary to ensure day-to-day processes keep running as normal during emergencies or natural disasters. We specifically understand the importance of doing more with less, to meet and exceed the needs of citizens nationwide. Freedom has vast experience managing both large and small scale procurement in the public sector. Before the PSN was established Freedom maintained a position on the UK Telecommunications Networks framework operated by the Government Procurement Service (previously known as the Specialist Solutions Framework). Our services include Unified Communications, contact centre deployment, mobile voice and data services and LAN infrastructure. Freedom’s broad PSN portfolio allows customers to benefit from the solution that best fits their needs, rather than promoting a solution that may provide an inferior service. Our proven expertise in providing ICT networking solutions, the breadth of our PSN portfolio offering and Active Support working culture provide a unique offering to the marketplace. Freedom ensures the project management of any solution has a defined transition path from an existing solution, working closely to ensure any organisational changes are managed professionally and sensitively. Our long standing relationships with business partners allow us to provide the best, most cost effective, solutions for now and ready for the future, irrespective of size or location. Our access to the all of the UK’s networks allows us to provide connectivity across the nation, enabling you to expand when necessary or offer remote working options. Providing fully integrated coverage of all required services, as well as integration with existing business systems and applications. We work to the highest security standards available to ensure that confidential public sector data remains that way. Freedom use a MPLS network with the CAS (T) security standard, which is the PSN security baseline requirement. Our Active Support team monitor our customer networks to ensure that everything is running smoothly at all times and even when things don’t go right, often it is this team who will spot the fault and rectify the problem before our customers even realise. Freedom is a Unified Communications System Integrator supporting commercial, public and local government mission critical communications infrastructures. Recognising the inexorable convergence of Voice, Data and IT within the business communications sector, Freedom has developed both the necessary in-house skillsets and leading-edge technology and communications business partnerships, creating a specialist capability to assist organisations with their transition from traditional technology to the new world of Cloud/Hybrid/On Premise Unified Communications. With over 26 years’ experience in data networking, communications, network services and end-to-end support, Freedom provide organisations with the opportunity to significantly impact their operational, commercial and financial performances through the intelligent use of technology.